My name is Garrett and I am an avid cyclist. I ride Mount Diablo a few times per week throughout the year. On March 27, 2018, I was involved in a Bike vs. Vehicle Collision on Mount Diablo involving California State Park Ranger Cameron Morrison (Please watch the video). It was a quiet evening on the mountain with minimal automobile traffic and a few cyclists. I was descending from Juniper (approximately 3,000ft). I arrived at the Junction stop sign and decelerated, looked all directions but did not do a complete stop. According to the Garmin on my bike, my speed ranged from approximately 25-33 mph. I continued down Northgate Road, passed the 1000 ft. mark and went through a few more blind curves approximately 4 miles. When suddenly a siren was turned on blasting behind me as I was entering a blind curve. The sudden blasting of the siren scared and startled me causing me to be knocked off my bike tumbling end over end multiple times and landing in ditch. I wasn’t able to breath as I got the wind knocked out of me during impact. I collected my bike all the meanwhile wheezing. Shortly thereafter the ranger got out of his vehicle and sauntered up to me and told me he was pulling me over for speeding. He stated he would not give me a citation only a warning at this time. On March 29th, I had surgery on my left clavicle which was broken in three places, broken rib and bruised ribcage. 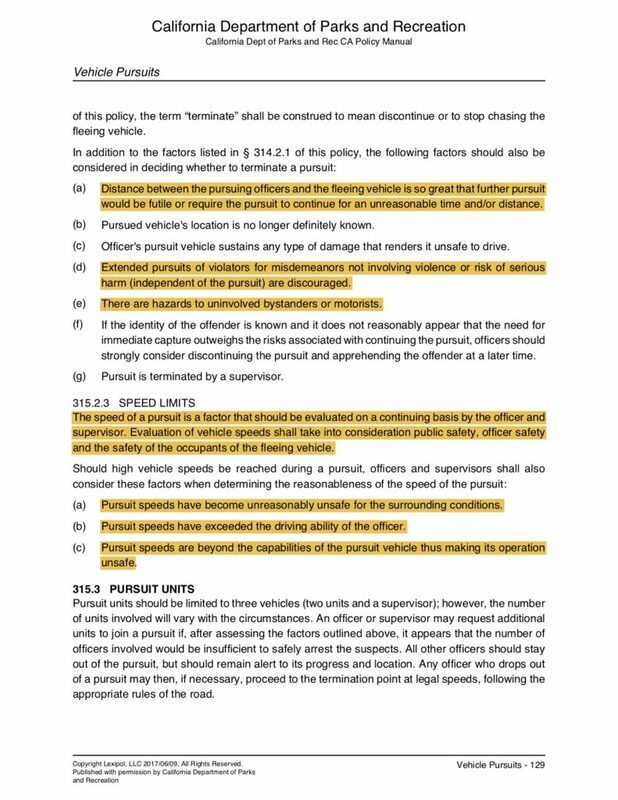 I feel that if Ranger Morrison had followed California Department of Parks and Recreation Policy #315 Vehicle Pursuits (Please review the document) this Bike vs Vehicle Collision would not have occurred! Instead, he ignored Vehicle Pursuit Policy, driving his large (non-pursuit certificated) truck, approximately 4 miles down narrow windy roads, around numerous blind curves, traveling at speeds of “25-45 mph” passing other cyclists and then waited to turn on and blast his siren until he was approximately 50-100 ft behind me, just as I was entering a blind curve, frightening and startling me, drawing my attention for a split second away from the direction that I was traveling and subsequently causing me to crash into the ditch. If Ranger Morrison had waited for a straight away before blasting his siren I would have been able to slow down and come to a complete stop. According to another cyclist on Northgate Road, “he pulled up behind me fast and sirened me just like you, I almost crashed too, he just passed me and kept going.” I’ve had many cyclist friends who have been startled, surprised and frightened by park rangers coming up behind them and turning on the deafening sirens. 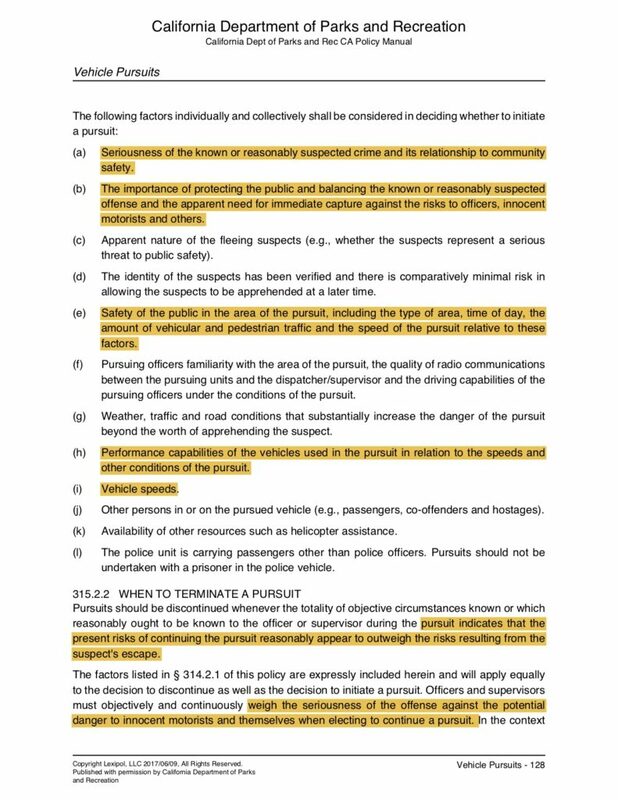 I believe Ranger Morrison’s actions may have violated several sections of the California Department of Parks and Recreation Policy #315 Vehicle Pursuits (Document attached). In addition, Ranger Morrison may have violated state law by conducting an investigation, Traffic Collision Report (TCR) of a Bike vs. Vehicle Collision in which he was involved and/or may have been a contributing factor to the collision. (Please refer attached TCR). 1. A meeting with you to discuss the incident. 2. 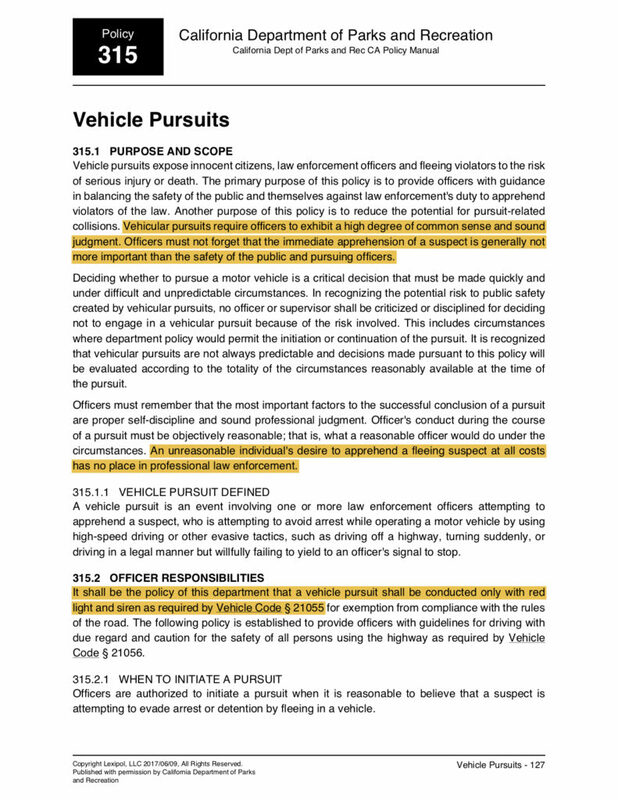 California Highway Patrol conduct an investigation as required by state law when a Park Ranger is involved in and/or may have been a contributing factor in a collision. 3. A letter from you to Lisa Mangat, Director of California State Parks concerning this incident. I look forward to meeting you and working with you staff to prevent future injuries and collisions on the roads of Mount Diablo State Park.